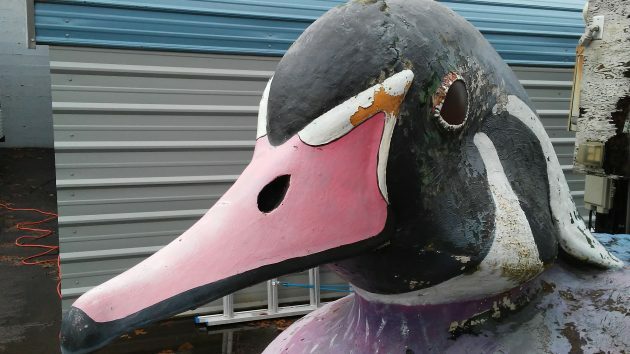 The Waverly Duck as it looked in storage last month. Things are looking up for the Waverly Duck and its Albany fans. It now appears conceivable that, if private money is raised, the floating creature can be repaired and eventually restored to its berth in the middle of Waverly Lake. At the request of Mayor Sharon Konopa, the city council last month agreed to accept the polyurethane creation as a gift from the widow of Mike Briggs, its most recent owner who died last October. But no city funds were to be spent. Tethered to the bottom, the duck, 13 or 14 feet long, floated in Waverly Lake for years. It became sort of an attraction to visitors and residents alike. But it was pulled from the pond in 2007 because it was getting in pretty bad shape. In recent years it’s been stored out in the weather on a former car lot on First Avenue, now the headquarters of Corvallis Tree & Lawn Care. The business owner, Mark Pickens, told me last month he’d be glad to keep storing the thing until somebody decided what to do with it. As for the ownership issue, that’s been settled. Konopa says the paperwork transferring ownership to the city has been completed. Our hats are off to Hasso who has exposed yet again the City’s propensity for alternate facts. While we don’t know for certain what time the action occurred, we do know that Parks and Recreation Director Hodney did inspect the fouled fowl. If Director Hodney performed this task in the course of his regular City job, and if he drove a City vehicle over to where the feathered friend is found, then by definition, City monies have already been spent on the Albany Duck. While this person has no objection to the City’s minimalist approach to the Duck Revival, it would be helpful if the City would avoid alternative facts. Alternative facts are funny things. Hasso’s post did not say Hodney inspected the duck. Hasso’s post quoted Hodney as saying “my guys” looked at the duck and will now develop an estimate of expenses. I’m not disputing your point, whatever it may be. No,….’alternative facts’ is an expression that can be interpreted several ways. Have you ever served on a jury? Alternative facts are lies? Lies involve an intent to deceive. The evidentiary standard to prove a purposeful mental state is quite high. Merely asserting something doesn’t make it so. The best you can say is you have a suspicion of lying. An example is in order. When President Clinton stated, “I did not have sexual relations with that woman (pause, eyes averted), Ms. Lewinsky”, we couldn’t honestly accuse him of lying because we didn’t have adequate evidence to support our suspicion. His falsehood, intention to deceive, and immorality became repulsively clear after the stained blue dress was made known. Clinton clearly lied to us. I suspect that your intention is to deceive us into thinking that Conway and Spicer are, in fact, liars given their use of the expression “alternative facts.”. I wonder… who is doing the lying here? Bingo! There is no “gray area” here. The fact that you mashed your keyboard keys to type out that long comment has zero impact other than to diminish your credibility. I will say it again. “Alternative facts” are lies.